TravStar1 Point Of Sale SystemRegister Manual Gas TransactionsHow Do I Restart the Dispensers after an Emergency Stop? 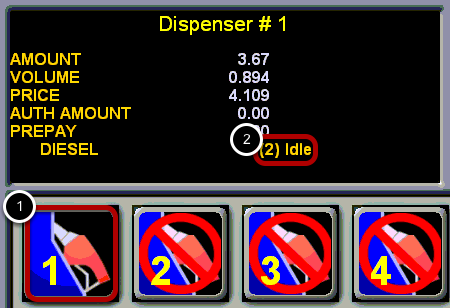 How Do I Restart the Dispensers after an Emergency Stop? This lesson will teach you how to restart the dispensers after they have been stopped. Select a dispenser by touching the dispenser icon. Touch the "Restart Pumps" button. (1) The dispenser icon for dispenser 1 is no longer covered by a red circle. (2) The dispenser status has changed from Stopped Off hook to Idle. Repeat this process until all stopped dispensers have been restarted. Prev: How Can I Stop the Dispensers in Case of Emergency? Next: How Do I Use the Rest On Pump Feature?